IVINS – As storm clouds rolled through Washington County Tuesday night, thunder boomed at times and flashes of lightning danced across the darkening skies. 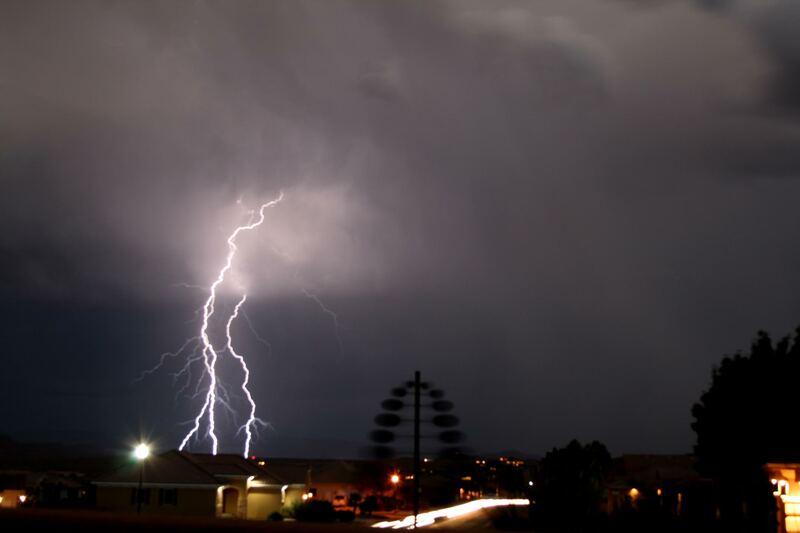 One of those lightning bolts touched down in Ivins – right on top of someone’s home. Prior to 8:30 p.m., the lightning strike hit the tile roof of a home at 443 E. 200 South. 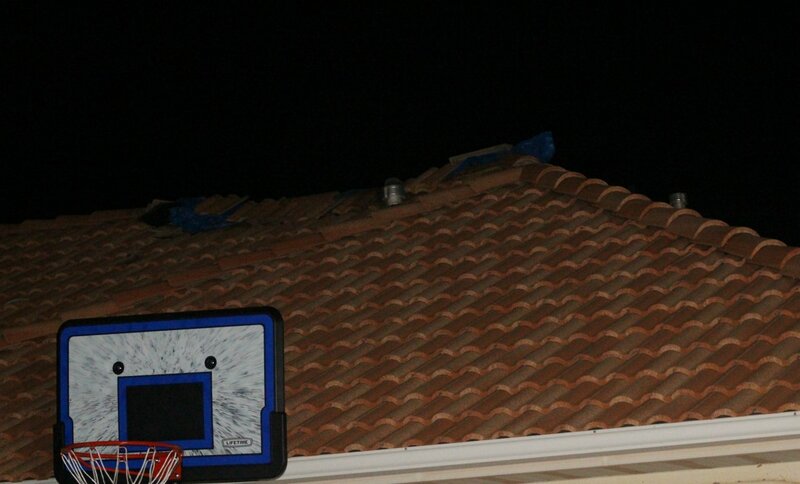 The strike blasted a hole in the roof and threw some of the tile onto the driveway below. intially it was reported that an occupant of the home called 911 to report a potential structure fire after hearing the blast and smelling smoke. The home was actually vacant at the time according to an email from St. George News reader Carly Amaral. Amaral and her husband, who are neighbors to the house that was struck, said they were driving by and less than 150 feet away from the residence when the lightning blasted it. They called 911 afterward with police officers appearing at the scene first, followed by firefighters. While firefighters ran into some faint smoke in the garage area, no other signs of fire were detected. The hole in the roof was covered with a tarp after firefighters inspected the damage. The occupant of the home, a woman renting the residence, was unharmed and declined to comment on the incident. Responding to the incident along with the Ivins Fire Department was also the Santa Clare Fire Department and Santa Clara-Ivins Police. No injuries were reported in connection with the lighting strike. According to the National Weather Service, lightning strikes trigger an estimated 6,200 structure fires a year, with 4,400 of those being homes. The lightning causes around 25,000 fires over all, including those lovely wildfires the region is prone to getting. The lightning-spawned fires claim an average of 12 fatalities each year. Call your local fire department and, if possible, have them check for hot spots in your walls with thermal imaging equipment. Make sure all smoke detectors are powered and operating properly. If needed, have a licensed electrician check the wiring in your home. As for the power behind a lightning blast – and why you never want to be on the receiving end of one – a typical blast of Mother Nature’s electrical fury is about 300 million volts and 30,000 amps, according to the NWS. “There is enough energy in a typical flash of lightning to light a 100-watt incandescent light bulb for about three months or the equivalent compact fluorescent bulb for about a year,” the NSW states on its lightning safety website. Ed. note: This story was updated to include new information supplied by Carly Amaral.